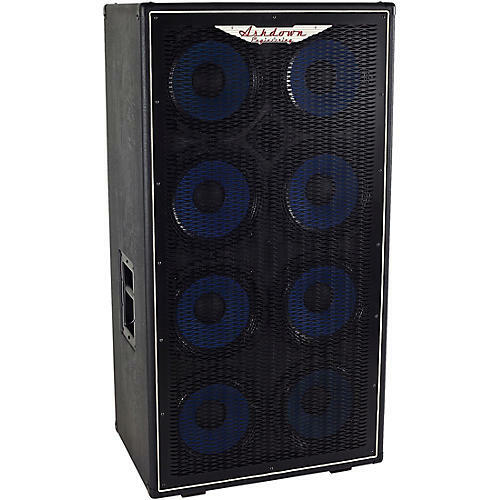 Fill even the biggest stages with deep, punchy bass tones with the ABM-810H speaker cabinet. Built to last, the ABM-810H is constructed using high-end birch plywood, rugged covering, metal corners, and a steel grille. Custom-designed 10 BlueLine speakers provide a fat, wide-range sound with tons of punch and power. From clubs through to stadiums, the ABM-810H bass speaker cab is ready to rock. Ashdown created its own custom speakers for the ABM series cabinets. The ABM-810H houses eight 10 in. BlueLine series speakers plus a switchable (Hi, Low or off) horn tweeter to give complete control over the high end. These speakers deliver the power, transparency, and deep low end you need without giving up the mid attack and high end you need for modern bass tones. No matter what type of gig you have, the ABM-810H is ready for action. The ideal combination of function and class, ABM Series cabinets are tour proven night after night by some of the biggest bands in the world. Featuring tough construction and reliable components ABM cabinets will take whatever is thrown at them night after night. Dimensions: 45 x 24 x 16.5 in.